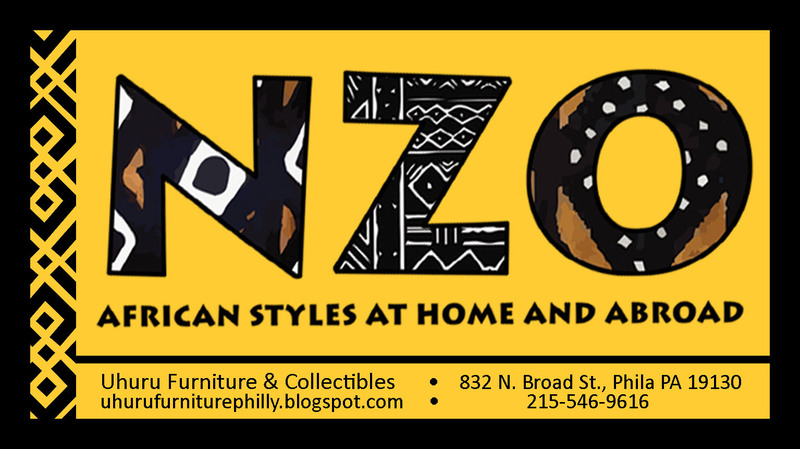 The much anticipated launch of the African People's Education & Defense Fund's (APEDF) newest economic enterprise, NZO, took place at Uhuru Furniture & Collectibles (UFC) on Tuesday, November 1st, in Philadelphia. "NZO - African Styles at Home and Abroad" is an exciting new African design product line developed by APEDF to expand the economic base for the rising African independent economy. NZO means house or home in Kikongo. NZO brings African self-reliance and revolutionary culture right into your home. Shoppers and supporters were met right away with a dynamic window display filled with African art, sculptures, Djembe drums, dolls, furniture pieces re-upholstered with vibrant African fabrics and two almost life-size statues of an African man and woman hand-carved in Ghana. As people walked into the store they were greeted with shelves bursting with beautiful cushions in varying African fabrics, stools and chairs newly-upholstered in gorgeous cloth, and tables, shelves and dressers hand-painted with African designs. The launch was a resounding success, greeted by tremendous enthusiasm and interest by the community. APEDF is bringing true African style and beauty to the African community as a logical extension of the widely-popular Uhuru Furniture & Collectibles which provides quality used furniture at very reasonable prices to the African and other oppressed communities. Many volunteers have already contributed their skills, knowledge and time to create NZO products. UFC Philly’s Visual Communication Coordinator Sarah Alsati is doing an excellent job of coordinating the development of NZO, learning new techniques, producing outstanding products and getting everyone involved! APEDF gives a special shout-out of appreciation to Denys Davis, designer and co-author of “Spirit of African Design” who shared her stenciling techniques with us and has herself made several pieces for NZO. Also, thanks to designer and long-time UFC customer Portia who created beautiful displays and to professional seamstress Brigitte Williams who produced the most beautiful African cushion covers for NZO. UFC Philly has also begun selling Fusion mineral paints and is using them to create NZO and “Painted by Uhuru” products. These will be central to the Buy Black Friday Sale, featuring African style holiday gifts, gift baskets and collectibles supporting African self-determination and self-reliance! The African People's Education & Defense Fund is developing NZO in St. Petersburg, Florida and Oakland, California in the near future, and it can be done anywhere people want to bring it. THE AFRICAN COMMUNITY IS TAKING BACK OUR OWN ART AND REVOLUTIONARY CULTURE FOR OURSELVES! JOIN APEDF! HELP BUILD NZO AND UHURU FURNITURE!